The frustration felt by pioneering honker and bar walker Big Jim Wynn must’ve been tough to take. For it was Wynn as much as anyone who set into motion the flamboyant mindset that saxophonists could be the focal point of a record and a stage show – a radical idea in an era of maintaining proper decorum on record and on the bandstand while remaining content to be simply one anonymous member of a larger ensemble – and now that rock ‘n’ roll came along and turned that on its head and rewarded gaudy showmanship Wynn found himself struggling to keep up. I’m guessing he wasn’t amused by the irony of it all. Over the last year the sax had slugged and honked its way up the commercial ladder, giving rock a sense of seamy lurid excitement that it needed to make its presence felt. One outrageous over-the-top instrumental followed another up the charts, but tellingly none of them belonged to Jim Wynn himself. This was his effort to change that. 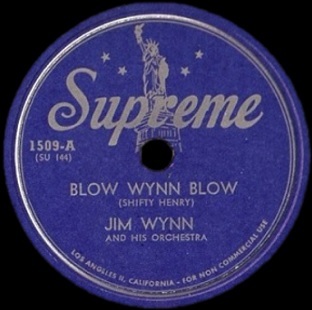 To spare you the suspense, Blow Wynn Blow didn’t become a hit, though it’s worth noting Billboard’s national race charts were still confined to a scant fifteen spots, so its missing out is hardly evidence of commercial failure. As late as December 1950 the trade magazines were still referring to this song when mentioning Wynn, so apparently someone was listening to it. But since this didn’t get any official accolades where the charts were concerned his overall stature remained somewhat more tenuous and he’d never fully break through to mass acclaim. So the real question, then and certainly now, is how good of a shot at the brass ring was it? Did this prove that Wynn had what it took to compete in the rock world with the rest of the degenerate horn blowers, or did it only serve to show that he was destined to remain an early influence rather than the real deal when the rock revolution he helped predict took over and promptly left him behind? The answer, somewhat thankfully if you ask me, is that he could indeed cut the mustard as a rocker. I say thankfully because based on Wynn’s first effort in the rock sphere, the underwhelming Fat Meat which was leaning back stylistically rather than looking forward, it appeared that he might just be one of those intrepid explorers who set sail searching for new worlds that few thought existed, spending months at sea fighting off typhoons, sea-serpents and mutinies from having too many pirates and not enough wenches (sorry gals, this is poetic license for a purely fictitious analogy). Then when Wynn finally spotted the promised land in the distance he got so excited he accidentally beached the ship on a sandbar then get stung by a poisonous jelly fish the moment he stepped into the shallow surf and promptly collapsed on the shore, bloated and swollen while the rest of his crew trampled him to death in their mad rush for untold riches and scantily clad native beauties that awaited them. The hearty intrepid captain who led them there would end up being food for the seagulls and he’d be lucky to get even one line detailing his role in the voyage for the history books. This record at least shows that he wasn’t destined for that type of sadly ironic fate after all. But whether Wynn would disembark at the beach and then promptly lead the excursion inland looking for lost cities of gold or if he would only set up a pup tent on the sand, roast hot dogs and cast off the next morning with nothing but a sunburn and a few seashells to show for their effort is another question altogether. 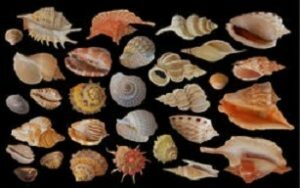 The answer… as I suppose you can guess… is that he came back with a real nice shell collection. As we’ve seen thus far with rock instrumentals – most of which featured the saxophone to this point, save for a few piano pounders – there were two primary ways to connect: the slow, sultry, addictive groove or the wild honking barnburners. Each formula therefore was pretty easy to replicate in theory, but in order to be successful at it three additional components were required. The first of course was skill. The voice of the sax comes from the technique of its owner and how each one applied that voice – how melodic, how frantic, how sensuous, how dirty they make it all sound – is obviously what will catch your ear. The second attribute they needed was the commitment of said saxophonist to deliver the goods. Many guys had the talent to provide what was needed but not all did so enthusiastically. Many thought this style was beneath them, little more than crude and undignified noise. They only consented to cut records like this because they were paid to and because it’d have more likelihood of success than sweetly blowing a pretty melody that would get the old folks gently swaying while the young kids, the ones who actually bought records, would fall asleep by the 4th bar. So a sax player simply going through the motions when it came to providing the requisite honking and squealing attributes, maybe even embarrassed about the whole thing should their friends, family and most importantly their peers with loftier jazz ambitions found out, wasn’t going to cut it. Lastly of course is the song itself. Many of these records were jams made up on short notice in the studio and so the horn player and their sidemen had to intuitively know what structure would best showcase their most explosive displays. That could be done many different ways though. You could come out of the gate screaming and ramp it up from there, giving no one a chance to breathe as you assaulted them with furious notes upon notes, hoping the adrenaline rush of the pace would be enough to win them over. Or you could slowly build to such a climax, letting each instrument have its own spot, all while mapping out ahead of time where the drama and conflict would be generated in the arrangement. Unless you were going for just sheer bedlam the melody needed to be memorable enough to leave a distinct impression. After all if each instrumental sounded roughly the same – all manic energy with nothing to root it in – then chances are a consumer wouldn’t need to even make a conscious choice of which one to hear. So there needed to be a hook, a riff, a progression or arrangement that would stay in the person’s head after the record ended and could be conjured up later on in the minds of the listeners which in turn would get them to seek it out again to relive the experience firsthand. Assuming you’re reading the section headings you can see where this is leading. Wynn’s skills were never in question, even when cutting bad material he certainly knew how to blow and had plenty of experience in a number of different stylistic realms where he could easily adjust to credibly pull off what was called for. His commitment could be more up and down, but like most that was probably based in part on his belief in the material, his personal goals at the time (getting paid or getting kudos and since they were often diametrically opposed, and which mattered more would factor into the results) and lastly his current stature in his professional career may tip the scales when it came to the effort put into all of this. At this point he was certainly at a bit of a low and needed to make a splash, which of course was a good thing for those who wanted him to jump into rock with both feet. Now it should be pointed out that it wasn’t that he was struggling by any means, he was well known, widely respected and in reasonable demand for live gigs. The difference though is other younger upstart sax players were now becoming MORE well known and in demand. The generation coming of age, whose fervent interest mattered most when propelling musicians to stardom in rock, were latching onto the likes of Earl Bostic, Hal Singer, Eddie Chamblee, Wild Bill Moore and Paul Williams, with even MORE crazed honkers appearing everyday to contribute to this unruly mess. Those fans didn’t know, nor would they care, that Wynn had pioneered much of the style in the days before rock came into existence. So if Wynn wanted to compete in this realm going forward he had to roll up his sleeves and get down in the alley with them. On Blow Wynn Blow he does just that with seemingly no reservations. So the first two tests he passes with ease, which brings us to the one that is a bit more uncertainty to it – the composition itself. This is where Blow Wynn Blow lets him down, if only slightly. He’s working off a song written by the exquisitely named Shifty Henry who was a prominent bassist and songwriter who was named dropped in Elvis Presley’s Jailhouse Rock (I assume you don’t need me to review those lyrics for you to find him in the penitentiary). He was very talented and wrote some good songs, but this one suffers from having no base to return to once it’s sent out into orbit with Wynn’s frantic blowing. It starts off very promising though, with the honking alternated with the title being chanted by the band, almost like a rousing request for Wynn to unleash some fury on his horn. He doesn’t disappoint, the riff churning with some high-pitched squalls while the backbeat – a key addition to the instrumental mix over the past year – keeps it all jumping. The best playing follows in an extended solo where Wynn’s grit matches his technical ability. The lines seem cut a little short rather than extending them as was often the case in these types of songs, preventing it from really getting unhinged, but it still manages to generate the appropriate excitement to keep hearts palpitating. But the problem is at no point during all of this frantic blowing do you have any idea what the melody is. Without the chanted vocal line you might not even be aware this is a proper SONG, thinking instead you wandered into an after hours jam session. It still manages to throw in some vital ingredients without mixing them well, but had they read the recipe more carefully, added the proper amounts of each spice and maybe stirred the pot from time to time they might’ve come up with a dish you can actually serve and charge money for. This is more like potluck. Without that structure, having nothing to return to after the solo, they’re left with a half filled plate as Wynn tries coming up with something to keep the spirit alive if nothing else, but it merely peters out rather than caps it off with a flourish. It wouldn’t have been that long ago, even during the past summer instead of the unappetizing Fat Meat, when this would’ve been much more of a filling course simply because the rock fan was so starved for this brand of unhinged excitement. That’s why timing is so important. Last fall or winter this would’ve seemed daring because the bar hadn’t been set as high, the early experimentations had been hit or miss and the formula had yet to be perfected. Then Blow Wynn Blow would’ve leapt out at listeners on the basis of its energy alone while its shortcomings wouldn’t have been noticed as much because there was so little to compare it to. By summer it might not have been able to quite match the best sides coming out, but since the sound was just starting to coalesce it would’ve found itself caught up in the overall excitement and more likely to be propelled into the spotlight. But now, after countless honks and squeals by a veritable parade of capable horn men the past couple of months, this doesn’t stand out as much. The advances made by others means it simply takes more to be noticed by the fall of 1948. It’s still perfectly suitable to march along with them, it’s not behind the curve by much, but it won’t be able to fight its way out of the middle of the pack and certainly won’t be leading the charge into the next frontier. Wynn’s chances for stardom grow ever dimmer as a result. He had been an innovator who came along too early to get credit for launching anything. He was a flamboyant showman whose wild stage routine was never captured on film like some who followed to lend some historical evidence to his impact. He was a talented musician who was now consistently at risk for falling one step behind those making their mark in rock by reacting to the trends coming along rather than setting them. Still, all things considered, this shows he was far from ready to give up and with this entry you can at least put Big Jim Wynn’s name in the official rock register as something more than just a forefather who couldn’t make the grade on his own once the children he spawned were off and running. He may not ever get ahead of them again, but he was at least still in the race. Leave a reply on "Big Jim Wynn: “Blow Wynn Blow”"